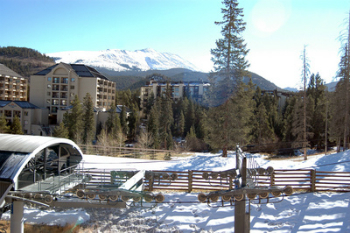 At the bottom of Peak 9 of the Breckenridge Ski Resort, just above the Quicksilver Lift, is a little trail over the river, and through the woods to Powderhorn condos for sale. Guests and residents deftly use this short little trail to ski-in and ski-out. In the summer, the ski trail provides river access, and fishing is good on this stretch of the Blue in Powderhorn's back yard. From Powderhorn, it's also an easy stroll to the heart of downtown Breckenridge, or to the start of a good hike in the national forest. The Burro Trailhead is a few hundred yards up the ski slope and the free town bus also serves Powderhorn Condos. On the street side, directly across from Powderhorn, is the Columbine pool with several hot tubs and a common area, available for use by homeowners and guests of the small group of condos in this area. You can find out more about living in Powderhorn, or browse the Powderhorn condominium listings below for the most recent homes available. Powderhorn condominiums look practical and they are. They were built in the late '70s of steel and concrete, with concrete drive and walkways and elevators from parking to the upper floors. Their no-frills exterior has required little maintenance. Any Powderhorn condo for sale will have a large covered balcony that was built into the design of the building, and is also concrete. Many of the homes look onto woods and the river. Driving to Powderhorn changed in 2000, when Main Street Station was built. Previously, cars had to negotiate through the Bell Tower Mall, but Columbine Road has since been reconfigured and is now accessed from Broken Lance Drive. The reconfigure eliminated drive-through traffic to condos on Columbine and made walking more pleasant, but didn't change how close Powderhorn is to shopping and restaurants. Size (SFLA): 939 sq. ft. to 1751 sq. ft. Located across the Blue River from the base of Peak 9, next to the Marriot. Drive south on Main Street to last stoplight at Boreas Pass Road, turn right on Broken Lance Drive. At the three-way stop, turn right onto Columbine, or turn left to remain on Broken Lance and then make a right on Columbine. The road is a loop and Powerhorn will be the fourth building on the outside of the loop, from either direction. 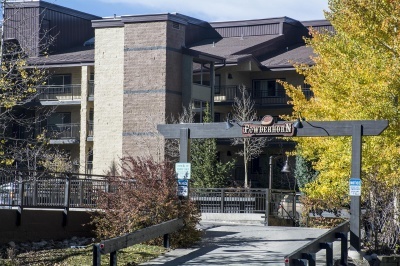 Send us a message, or phone us at (970) 453-2200 to discuss the condos for sale at Powderhorn, or other Breckenridge, CO areas.